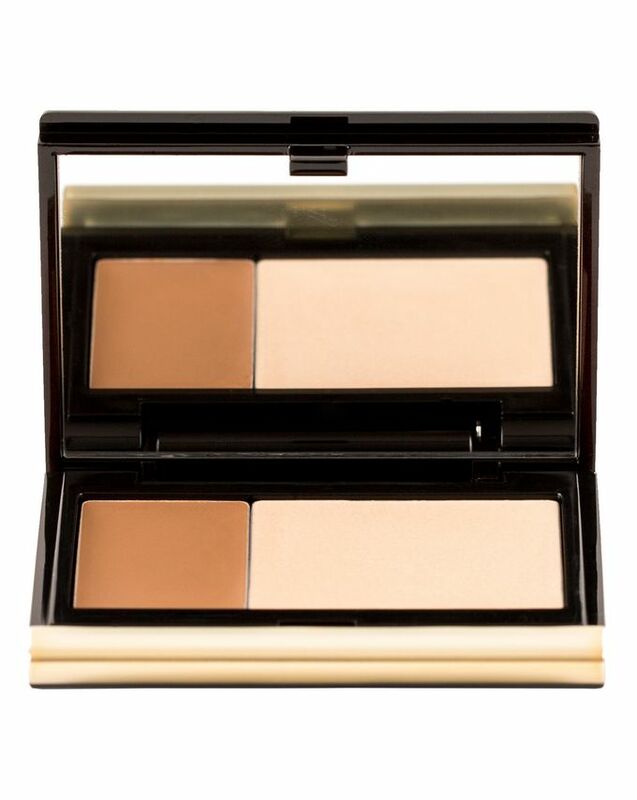 A beauty-to-go essential, Kevyn Aucoin’s Creamy Glow Duo is a chic, streamlined palette housing velvety, cream contour and highlight – for defining and illuminating in an instant. 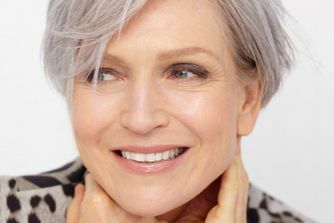 Long-lasting and skin-friendly, the emollient formulas blend easily yet stay put, creating believable light and shade that enhances your natural beauty, without any smudging or shimmer. ‘Candlelight’ works like a soft-focus lens, blurring imperfections whilst imparting a subtle, ethereal glow, while the grey-toned ‘Sculpting’ is ideal for adding depth (and permanence) to shadows for three-dimensional, Kate Moss-worthy cheekbones (even where there are none). And like all things Kevyn Aucoin, the decadent garnet packaging feels incredibly glamorous, making make up application an absolute pleasure! 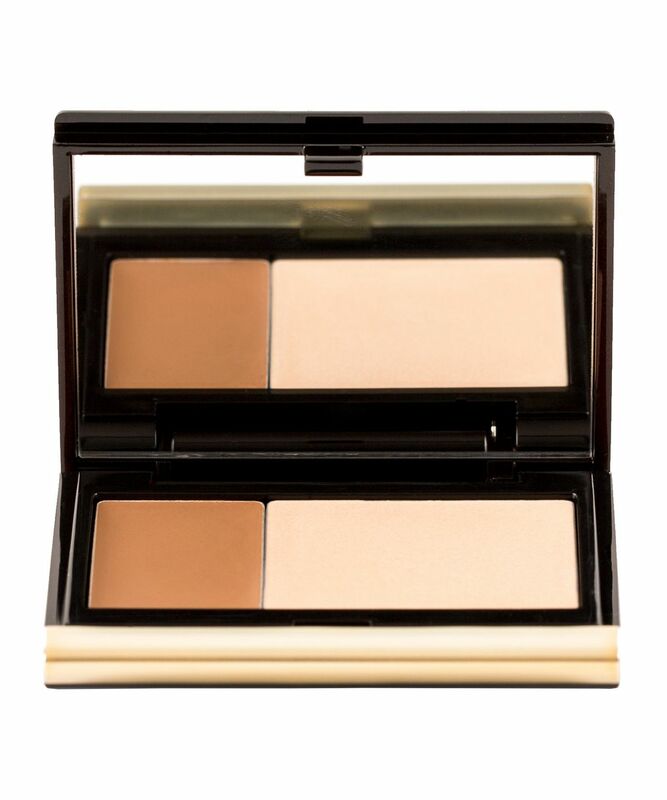 Contour on the go with this sumptuous duo; velvety cream adaptations of bestselling ‘Sculpting’ and ‘Candlelight’ to help accentuate your best assets. The ultimate handbag companion, the neutral toned matte taupe, imparts subtle definition without any glimmer or tell-tale orange tones – ideal for exaggerating your cheekbones and natural contours, while ‘Candlelight’ lends flattering luminosity to the high points of your face. The Sculpting Powder and The Celestial Powder in ‘Candlelight’ are deservedly cult – beloved by make up artists, editors and beauty bloggers alike – and now we bring you both, in convenient crème formulations for fingertip application (and clutch bag space-saving). Packaged in a portable push latch compact, apply to cheeks with your fingers or The Foundation Brush for smooth and streak-less application. The ultra-sheer formula. Dabbed onto the cheeks and blended upward and outward, application couldn’t be any easier! Caprylic/Capric Triglyceride, Trioctanoin, Neopentyl Glycol Dicaprate, Tridecyl Trimellitate, Dicalcium Phosphate, Candelilla Wax, Microcrystalline Wax, Carnauba, Glyceryl Dilaurate, Ceresin, Grape Seed Oil, Octyldodecanol, Lauroyl Lysine, Propylparaben, Ethylcellulose, Tocopherol, Ascorbyl Palmitate, Lecithin, Citric Acid. May Contain (+/-): Mica, Titanium Dioxide, Iron Oxides, Carmine, Ultramarine Blue, Manganese Violet, Ferric Ferrocyanide, FD&C Yellow 5 AL Lake, D&C Red 30, FD&C Yellow 6 AL Lake, D&C Red 6, D&C Red 7 CA Lake, FD&C Blue 1 AL Lake. This would be something that I would recommend to anyone and everyone. Totally worth the hype. Buy it if you are into more natural contour and highlight. Must have in my makeup bag. Next would be powder duo from the range! The price point is good when compared to the original powders sizes. You get the best out of both worlds. Perfect! Contours wonderfully and the candlelight cream creates such an unbelievably amazing glow! This is a tiny little size, perfect for travel, the product is really blend-able and they are the perfect colour for my skin tone (for most skin tones I reckon). The highlighter is subtle and brings a nice glow to your face. Hits the spot for me. Love it. The product is great. It’s super blendable and the contour color is soooooo great. But the package is so tiny little! I spent 22.5 pounds for a little tiny thing. If you are on a budget, don’t remcomend it. But if you don’t care spending that much money on this tiny precious, it’s a pretty nice product. I rank 4 stars cuz 5 stars for product -1 for the amount. Look very nice and looking forward to trying it.